NBA game at Mall of Asia Arena? Home » Featured » Mall of Asia » MOA Arena » NBA » Sports » NBA game at Mall of Asia Arena? This is it guys! I saw an early morning tweet came from MOA Arena’s Twitter account saying, “big things are coming” with the logo of the NBA. I think one of the NBA game will be played at SM MOA Arena. 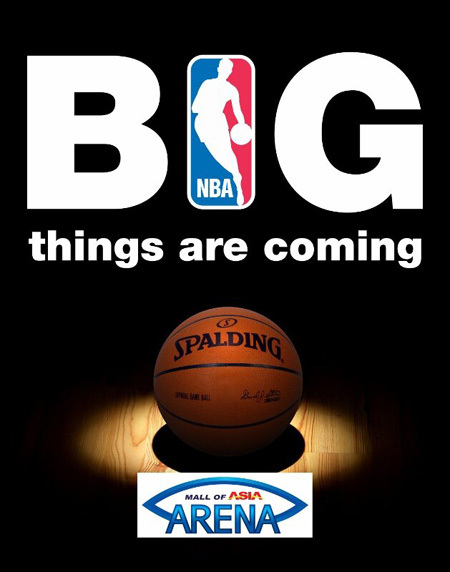 MOA Arena used the hashtag #BIGTHINGSARECOMINGTOMOAARENA and upload the picture of the Spallding ball with the word of "BIG things are coming" together with the NBA and MOA Arena logo, like what you've seen above. If you're looking for a date or schedule of the NBA game in MOA Arena, sorry but the management didn't release any information about it. However, ESPN reporter Brian Windhorst tweeted that the Indiana Pacers and the Houston Rockets may play a game in the Philippines. For the meantime, if you like this post and you want to be updated on NBA game at Mall of Asia Arena, please bookmark this page and share it to your friends on Facebook, Twitter and Google+. Comments or suggestions about "NBA game at Mall of Asia Arena?" is important to us, you may share it by using the comment box below.